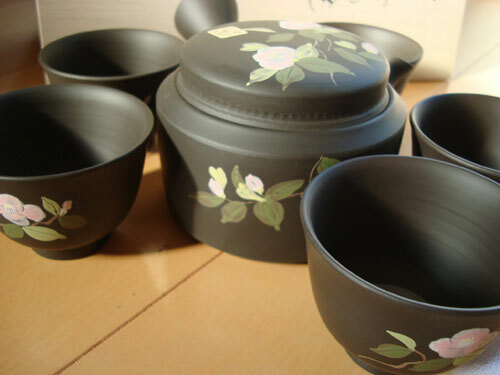 Japanese ceramic tea sets are renowned for their fine craftsmanship. The rich earthy color of this tea set is beautifully offset against the tsubaki (camellia) flowers. Japanese ceramic tea sets are renowned for their fine craftsmanship. The rich earthy color of this tea set is beautifully offset against the tsubaki (camellia) flowers. The tsubaki is often used in the tea ceremony as a decoration in the tokonoma alcove of the tea room. 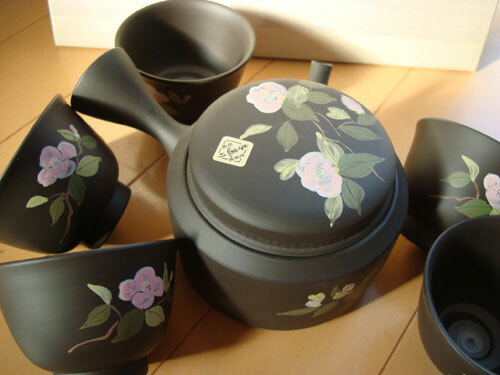 The set comes carefully packaged in an inscribed wooden box and includes: the tea pot (kyusu), and five tea cups.